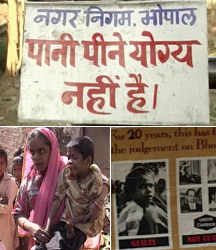 A law ministry note in 2008 clearly said that Dow Chemicals is liable for cleaning up the toxic Bhopal site. Despite this, Dow Chemicals claimed that the Indian government gave it an assurance that it is not liable for the clean-up. "The ministry of law... has observed that irrespective of the manner in which UCC has merged or has been acquired by Dow Chemicals, if there is any legal liability, it would have to be borne by Dow Chemicals." However, Dow spokesman Scot Wheeler told NDTV on Sunday that Dow Chemical has never had any presence in Bhopal nor does the company have responsibility for any liability relating to Bhopal. Wheeler says Dow has sympathy for the victims and the solution to their problem was in the hands of the Indian central and state governments. He also said that when Dow acquired the shares of Union Carbide Corporation in 2001, it was with the understanding that Union Carbide had settled its civil liability with the Indian Government.